Hughes and Salvidge were appointed to the role of Principal Contractor for demolition works at the Earthline Quarry in Shipton on Cherwell in 2015. The demolition works were undertaken over two weeks in August. The chimney was located within a live quarry but was set apart from the live processing area. The chimney base was approximately 46m from a railway line to the east. Pre-weakening works were undertaken during the week and explosive demolition works were carried out under a possession from Network Rail. The crane was set up and positioned as per the specialist contractor’s RAMS and lifting plan. The crane had slew restrictors set to ensure the crane could not slew over the railway line. 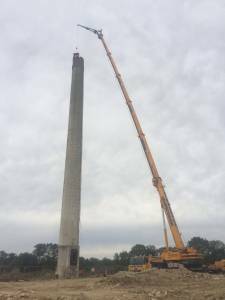 The area was vacated by all other personnel and the crane lifted the operatives to the top of the stack. Operatives used hand tools to remove loose brickwork, pushing the arising material into the confines of the stack. All loose brickwork was removed from the top of the stack working around the chimney. All predrilling works and explosive demolition works was undertaken by PDC Ltd, our specialist explosives contractor, as per their method statement. We controlled the exclusion zone set out by PDC Ltd and explosive demolition of the stack was undertaken during Network Rail possession of the railway track and with a Network Rail supervisor present. Local authorities and police were informed of the event to ensure rights of way and public footpaths are not contained within the exclusion zone.